Of course, we want to try and see other places. But I really fell for Alubihod Beach where Raymen Beach Resort is, in Guimaras. When we were there, it was private enough and the sand and water were just so clean, it was heaven for little kids. Since the place was clean, the staff friendly, the restaurant food was great (for the money)... and they had cable TV, it seems like the perfect place to just let kids enjoy an unspoiled beach. Of course, where sand goes, Boracay's is still the finest.... but the area is also super commercialized already. 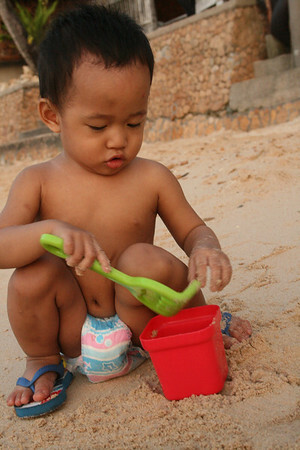 So, someday, I want to go back and just let my sons frolic in Guimaras beaches. Maybe they can go swimming naked again, haha, at Guisi beach.